It’s not yet midday and today is already a wonderful example of what it means to wear a lot of hats in your work. This morning I’ve edited images, downloaded videos, uploaded those videos to youtube and facebook along with titles, description, tags and links (very important), fixed a couple of bugs in the code for our public website around videos, chased up our IT company about a ticket or two (particularly making clear the need to heartbeat communication at each step of a ticket’s lifespan), been on the phone helping set up a new employee, generating some lists of data for that new employee to start working on, worked on my two inboxes trying to get them a little cleaner (am a zero inbox guy) and have started to have a look at what I was really supposed to do today. But that’s just it hey. When you wear a lot of hats, what you are “supposed” to do is wear those hats. What you _plan_ to do (which is important, no doubt) is often not what happens. The old “no plan survives contact …” saying. It’s hard, because those of us for whom structure and process is important, well when we make plans with our many hats, it’s hard to then work through that our plans aren’t happening the way they were supposed to. But the world is broken. The second law of thermodynamics points to this, that entropy increases. It’s easy to sometimes think that planning then is useless. I’ve been eight years now in my current many-hat work, and we have been militant in our planning, but also we have worked hard to be flexible rather than brittle. And it has paid off. Our system has seen the benefit of planning over the long-term – Because while sometimes our plans don’t go as we think, sometimes they do. And sometimes the plans change a little. And sometimes after a few days/weeks/months we come back to the plan and realise it was stupid anyway. This week we stumbled over a gag that is now easily one of my most favourite in any funny-business, ever. We’ve been slowly but steadily working our way through the early seasons of The Simpsons. Homie the Clown wasn’t an episode I remember being that funny. It wasn’t in my memory palace pantheon with Seasons 4 and 5 (and some of 3) like Cape Feare, Homer’s Barbershop Quartet or Mr Plow. Which made it such a surprise to find one of the funniest and most complete gags I can remember. It made me laugh and continue to laugh as we watched it at least a few times over, the younger kids looking at me and laughing because Dad was laughing uncontrollably. Homie the Clown is the fifteenth episode of Season 6 of the Simpsons. Homer goes to the new Clown College where Krusty teaches them how to be a Krusty-branded Clown. A recurring piece of plot in the episode is the tiny bicycle. Krusty shows them how to ride one (successfully riding the bike through and around the loop-de-loop is integral to the story itself it turns out). And Homer has a number of different methods of not-mastering the tiny bicycle. One or two of these attempts in is, in my couch-potato opinion, one of the greatest, most complete gags in anything I’ve had the pleasure of laughing at. The setup is simple, Homer is trying to ride the tiny bicycle. The payoff is immediate (the scene is only a few seconds long). Homer starts riding the bike and his clown pants (snug on Homer who has never had a pair of pants that fit so well) get caught in the pedal. He’s trying so hard to get the cycling right his tongue is poking out between his lips in concentration. Homer continues to pedal, doing well, but his pants are slowly pulled down and off and he’s left riding bare-bottomed on the bike. If you’re in the mood it’ll crack you up. But where this gag is so masterful is in the next sub-scene. Krusty is there with an off-sider watching. After Homer has left the view, Krusty continues to watch in that direction for a second or two. This wait is hilarious. You can just imagine he’s trying to process what he’s just witnessed. It had me in stitches. It’s a few seconds of perfect (if somewhat juvenile) comedy. Brings a giant grin to my face just remembering. I don’t have a super-great understanding of the mechanics of comedy, but I know what I like. And Homie the Clown is now definitely on the list! There was a time when I blogged a lot. Posts would appear regularly. WordPress was gaining traction, Facebook had bloomed, and the year was .. 2005/6 maybe? Back then I had purpose with what I wanted to put online. But it wasn’t a great purpose. Wow. This blogging thing is great. I really need to blog like those well-known guys do. Gain a following. Have people listen to me. That feeling has come and gone since then. Every couple of years I get the urge to try and do “stuff”. So I’ve downloaded and installed Windows Live Writer. Wow. Not sure what it is, maybe I just can’t get away from having a desktop program to write in. Where did all the #140Word stories go? 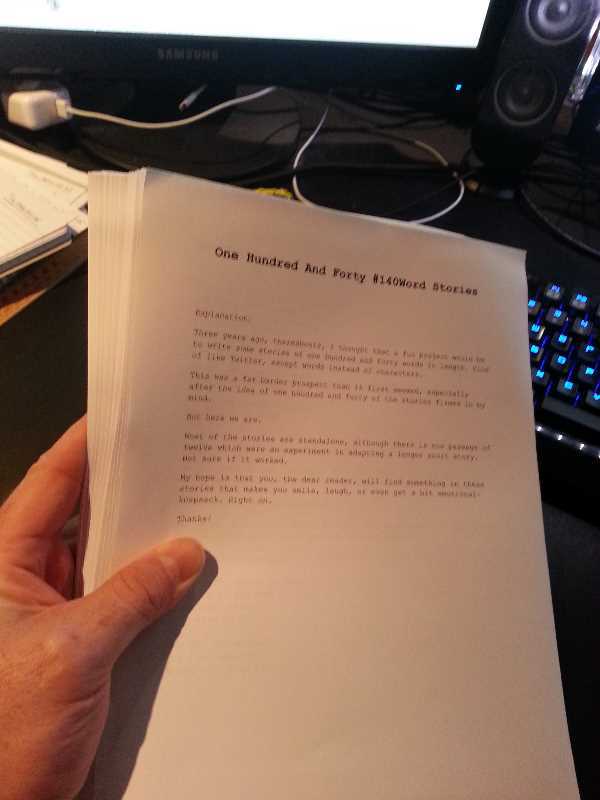 If you are wondering where all the #140Word stories of the last three years went, wonder no more! Now that I’ve finished the first draft, it seemed wise to (temporarily perhaps) remove them from the site. I really like the idea of people still being able to read them from the site, once the book is published. I love that people might look at them, and match up against the book what changed etc (in terms of writing process, editing etc). Not that I’m big-headed enough to think people will voluntarily do it, but on the off chance I command my kids to do it. The One Forty Words website will soon go live. From then on, it will be the focus for the stories. This is a brief piece I gave at the Celebration of 25 years ministry for Dad and Mum recently. It’s very much written to speak not to read. Also, I ad-libbed a bit in the actual talk. It is a great privilege to be able to come before you today. Thank you to Gordon for asking me to speak on “Life in the Manse”. In preparing I had to answer a number of important questions. Was growing up in the manse akin to being the child of a hollywood movie star? Spoiler alert: No. Not really. Was life in the manse a dreamy cascade of dancing through tulips swinging baskets of flowers through the air? Again, no .. Not really. I’m incredibly thankful to God for the privilege of growing up in the manse. We were at the coal-face of ministry. My Dad and Mum SERVED people for a job. Dad preached the gospel in and out of season. Mum gave of her time and energy to promote the gospel to all those around. And we grew up in the nurture and admonition of the LORD every single day. I’d like to talk about growing up in the manse. But fair warning, it is well known that my capacity to remember events is slightly biased and limited. Chores were a part of our life from a very early age. As their name suggests, they weren’t fun and sometimes involved the spilling of blood, as this next unbiased and very accurate memory will show. It was pre 87 in the kitchen of the manse in a sleepy little town called Miles, qld. A dispute erupted between Katy and myself over who would dry up the big sharp knife. I won’t make any judgement calls, but it was me, the placid and restrained personality that ended up with blood streaming from my thumb. Obviously I survived this vicious encounter a wiser and more refined character. As we grew and got older, the chores increased in their complexity and variety. I believe it was here in Tamworth that the first ROSTER was created. The Roster was a cause of much grimacing and griping. But in the end, a Roster provided stability. And stability is what chores gave us. We would mumble and grumble, but doing the daily and weekly chores instilled discipline and work ethic. At least, it did for me. But I’m the oldest, and we all know parents start slacking off after the first kid. Life in the manse was heavily shaped by our relationships. Manse life involves being a part of the church community. You share in all the different elements of people’s lives. There are times of grief and times of joy. Any given day at the manse could bring a whole range of emotion. Lets face it, ministry is in large part made up of births, deaths and marriages. It was an honour to watch and experience my Dad and Mum minister to all different people in all different situations. Growing up in the manse taught me a great deal about life, it’s sudden changing nature, and what was really important. That we hold on to the truth that is only found in trusting Jesus. The tension and pressure that whirls around politics has always been foreign to me. The first time I got to vote, it was at a youth camp up in the wilds near Tamworth. I voted for who my parents voted for. My good friend and political mind Gra was there, and still ribs me today for it. It wasn’t because I couldn’t think through the issues, or worry over who would do this or that or where the country would go with my vote. It was because, in the simple parts of my brain, it didn’t matter so much. But that’s me. Politics ARE very important. They form part of God’s Will for our creation. The Bible is very clear about respecting our leaders. It says to do it. Simple. There’s a gentleman in the U.S. who has a blog about christian ministry. It’s really good. Heartfelt and passionate, broken and humble. He wrote a piece called “On God’s Election of Obama”. It’s a very clear rebuke (and encouragement) not to make an idol of politics and not to forget that our Almighty God is absolutely SOVEREIGN. One line in particular hummed and sang in my heart as I read it. The worst event in the history of the world is when we hung our Creator on a tree and let him die. We all went to the polling booth and said, “We will not have this man to rule over us.” We voted against the very incarnation of goodness, righteousness, and truth. Ahhh, perspective. How good is that! WE ALL WENT TO THE POLLING BOOTH. Thanks Mr C Michael Patton .. The Lord bless and keep you and yours. The below was a short address given at Mum’s Book Launch for My China Mystery. My memories of Grandpa center around a number of points, moments in time. There is Grandpa standing in the pulpit, dressed in heavy black robes and white collars, as it seemed in my memory. His baritone voice commands attention, even from a young boy given to having his head in the clouds more often than not. He preaches with a confidence born of the text of God’s Word. He sings deep and full, praise to his King. He prays with arms outstretched – an action I have thought on long and hard. Grandpa prays with his whole heart, and as a preacher, as a shepherd of the flock, he prays for the portion of God’s flock that are before him. There is Grandpa in the garden. His daggy comfortable mended pants and shirts weathered and worn as he was, craggy features, white stubble. His hands care tenderly for the plants. The vines, the trees, the fruit and vegetables. He prunes and gathers and grafts. He is a gardener reflecting the Great Husbander, God the Father, who loves and cherishes the true vine, Jesus Christ, and the branches, us. Which brings up the memory of Grandpa at the end of the table. Eating porridge with great tablespoons of brown sugar liberally sprinkled and mixed through it. He reads from Gods word at every meal. Reads and then unfolds. He speaks of the scarlet thread of Christ being present throughout the entirety of the Bible. He speaks of the importance of faith, and has us go over the book of Romans where he points out specific verses and passages that bear the point and focus of our faith. And he sits at the table and prays. He prays long, which for little minds can sometimes be hard to maintain the discipline of listening and following along with the prayer. But we sit quietly, hands together, eyes closed. We listen to Grandpa pray, and often the memory of Grandma, who died before my memories really became clear, of Grandma punctuating the prayers with her own agreement of ”amen”. Before all else these memories point me back to Jesus. They remind me to be daily turning to the Lord. To read His word every day. To wrestle with and cry out to Him in prayer. My memories of Grandpa, and the few of Grandma that I have, they serve to humble me before the cross of Christ. Because in the end this heritage that we have is not made of mans boasting, of how great and mighty my Grandpa was, of his abilities and strengths, or even of his weaknesses. These are important, but they are not paramount. This heritage our family has been given is of an eternal and everlasting nature. It is a heritage ordained from before creation. It is a heritage given by the Lamb slain from before the foundation of the world. It is life in Christ Jesus, owning Him as Lord and Saviour. It is submission under the sovereign and immovable will of the Almighty God. My Grandpa is a big part of my memories. Most of all because he points me to the King and says “look to Him”. At our wedding Grandpa read out a prayer he had typed up on his battered old typewriter. In finishing I’d like to read it now. Almighty God, Omnipotent, Omniscient, Omnipresent, our Heavenly Father, source of all life and love. We beseech Thy blessing on – names – who have covenanted in Thy presence to live together as husband and wife. We pray that You will unite their hearts in true sympathy and love that their life together might be a shining example of Christ-like affection, pure religion and consecrated joy.